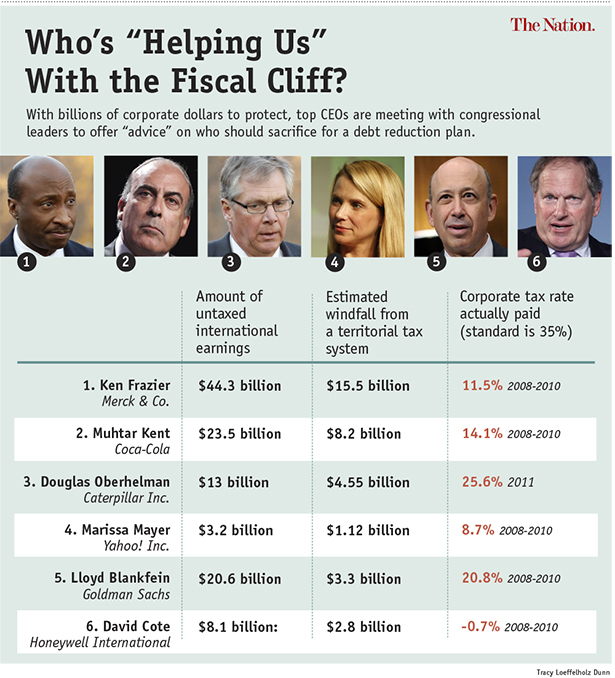 The sacrifice preached by these CEOs in the fiscal cliff debate is most certainly one-sided. 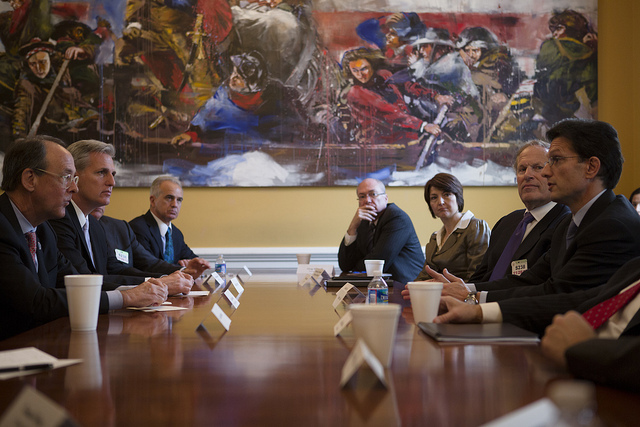 CEOs from several big corporations meet with House Republican leaders on November 28, 2012, in Washington. Photo courtesy of the Office of the Majority Whip. A merry band of corporate executives is zig-zagging Washington today, meeting with almost every principal player in the “fiscal cliff” negotiations. The CEOs are meeting with administration officials at the White House, with House Speaker John Boehner, and with House Minority Leader Nancy Pelosi. According to most press accounts, these business titans are “pressing for a solution to the so-called fiscal cliff” (Bloomberg), while “touting the virtue of bipartisanship and shared sacrifice” (The Washington Post). But what’s important to understand—what every press account of these meetings should note—is that they’re not, in practice, proposing any sacrifice from their companies in particular nor their industries in general. Key planks of their proposals, explicitly articulated by the Fix the Debt campaign and other industry coalitions pushing for a deal, include a lower corporate tax rate—even though many of these companies pay little or no corporate taxes as it is. Then there’s a territorial tax system, which would allow corporations that have profits parked overseas to bring them back home without paying any taxes. (Right now, they’d be obligated to pay the normal 35 percent corporate tax on those profits if they were repatriated). Some, but not all, of the CEOs also want the Bush tax rates extended for all earners. That’s not exactly “shared sacrifice.” A report from the Institute for Policy Studies notes that the 63 CEOs behind “Fix the Debt” would reap $134 billion in tax windfalls for their companies just from a territorial tax system alone. That naturally would increase, not decrease, the deficit, so somebody’s got to pay—hence the Very Serious pleas to “reform” Medicare and Social Security. To put a finer point on it, here is what the nine CEOs tooling around Washington today stand to gain in the fiscal cliff negotiations—how much their company would gain from a territorial tax system, and how much the individual CEO would gain if the Bush rates on top earners are extended. Ken Frazier, CEO, Merck & Co.
Douglas Oberhelman, CEO, Caterpillar Inc.
Marissa Mayer, CEO, Yahoo! Inc. Notably, none of the corporations represented in Washington today except Home Depot actually paid anything close to the corporate tax rate of 35 percent. Most would benefit handsomely from a territorial tax system, though not all—the interests of these companies don’t always align perfectly. Some, like Honeywell and Yahoo!, wouldn’t gain anything from reductions to Medicare and Social Security—the demands from those CEOs to cut spending on those programs is perhaps nothing more than a cover for their windfalls elsewhere. Others, like Goldman Sachs and Aetna, surely would benefit from a reduction in these programs. What’s clear, though, is that the sacrifice preached by these CEOs is most certainly one-sided. CEOs aren’t the only ones with a lot to gain from these negotiations. Lee Fang reports that a congressman heavily involved with the “fiscal cliff” talks has already been hired as a lobbyist.